One of the keys to getting started is to understand where we’re going. Ascending and seeing in the courts of Heaven, the trading floors and the council is a wonderful and meaningful experience, but we’re not stopping at mysticism, we’re building the Kingdom. Just like a skill saw is a tool to build a house, the seer gift is a tool to build the Kingdom. 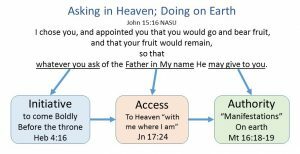 One of my favorite comments on Seers and Doers has been, “What difference does it make?” It’s a fair question because the fruit of seeing what is going on in Heaven is the authority to bind and loose those same things on earth. We don’t just come back with amazing stories of revelations. We are bringing back strategies and solutions to real-life issues on earth. It’s one thing to preach and prophesy about what God wants to do, the next step is to do it . . . in a mountain and make a difference. I’ve noticed a practical difference between hearing and sharing what we hear, and seeing and doing what we see. We live in a cultural information age with a bias toward believing that if we know something, we possess it. We also live in a prophetic church culture which defines faith as knowing what God wants to do and believing it’s our job is to share it, preach and prophesy it . . . not quite the same as doing it! The courts, trading floors and council are all visual places that activate our seer gift so we can see what the Father is doing. It’s also a place of fellowship and interaction where we ask questions and participate in strategies and take notes. Friends know their Father’s business (Jn. 15:15-17) because He shows us. First, we learn our assignment in heaven by seeing it . . . so that you might go and bear fruit—fruit that will last. Trees don’t strain to bear their manifestations, neither do trees appoint themselves and decide which fruit to bear. There is a significant place for initiative, but it’s within the context of our book and what our Father is doing. We each have a measure that can be measured. The practical side of moving from revelations to manifestations doesn’t lend itself to a recipe. It’s too relational and dynamic. But in general, we ask in heaven and tell on earth. We see the resources and strategies in heaven and just speak and do that same thing on earth. We’re Seers and Doers! The challenge – It’s easy to preach the word, declare things by faith and move in a prophetic anointing based on what we hear. The challenge of the council is being disciplined and patient enough to see it first in heaven, and then go and do it on earth. It’s a totally different realm of authority and it is exactly what moves us from revelations to manifestations. Fruit is something that can been seen on earth (measured, evidenced) . . . in healing, finances, businesses, personal lives, politics and changed nations. Can you see the dilemma of unanswered prayer? We press to pray more, be more faithful, research our shortcomings and repent, study the word to increase our belief . . . the list is endless, and the lack of fruit tempts us to wonder why God abandoned us. It’s frustrating. The council is different. Nothing can separate us from the love we experience in His council; not trouble or hardship or persecution or famine or nakedness or danger or sword (Rom. 8:35). 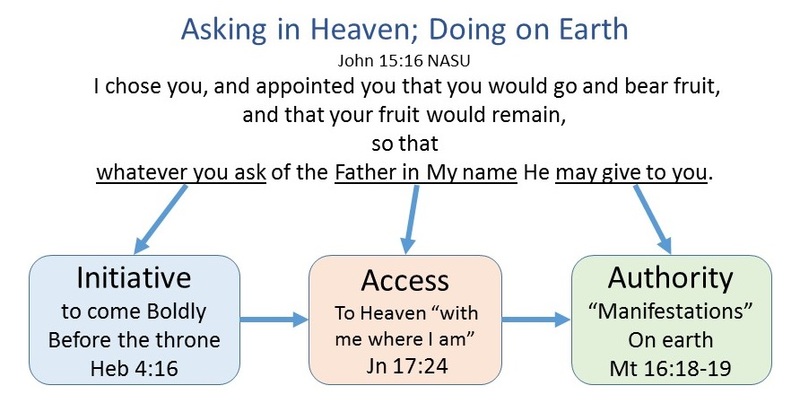 The answer to unanswered prayer is always the same: see the face of Jesus in the council and have the conversation on the strategy to go forward. Delays and difficulties make sense in the context of the council and everything else the Father is doing. We don’t just believe in our heads that there must be an answer. We don’t just hope for it because we know God hears our cry. We see it, because we have a loving Father who shows us His business and we made the trip to see it. That’s the promise. Can I do it? – Yes, you can. Trying – Is it easy? Well, we have to believe that He’s a rewarder of those who try. Then it’s easy. It’s impossible if I don’t believe I can do it or if I don’t try. Everything that helped me is in Seers and Doers. Feel the theological mandate to be one of the sons all creation is waiting for. Obstacles – Use the courts of heaven to check roadblocks in my own life or blood line. Listen for the accusations behind unanswered sin, agree with them and ask Jesus to redeem and restore. Use the trading floors to undo compromise where we traded away the priority of putting the Kingdom first. The starting point is always getting our book back intact. The lifestyle is walking in a spirit of repentance. Every time something new comes up, I am before the cross being washed. Mystery – What if I’m not seeing anything at first? What if the manifestation of what I do see is delayed? The best place for me is right before my Father in Heaven’s council. I’m listening, looking, asking and being both persistent and patient . . . regularly. Present in the council is a central part of my kingly and priestly lifestyle. It’s fun! – Seeing in heaven and doing on earth has two facets: 1) the release of the Father’s word from heaven to earth is as natural as the rain growing crops—it flows through us, and 2) it’s a thrill to be a son or daughter who carries what we see from heaven to earth. All creation has waited for us and celebrates with us! If you get stuck or need someone to talk to, I’m one of those people.